Saturday, Grounds Maintenance Tasks begin at 8:00 AM. Note: Firearms ranges closed until workday is complete. No other events are presently planned however it is always prudent to check with the official Chapter Calendar for any last minute changes. The Power of Change recently awarded our Chapter with funds for our Honey Bee conservation effort. If you are in the REC service area enroll today at the Power of Change web page to allow REC to make grants like this to worthy programs like ours. See the Activities Tab for an article on the recently held Wild Game Dinner at the chapter house on March 16. The Chapter has instituted a new policy for trash disposal at the ranges. Simply, if you bring any material into the range areas, to include targets, temporary target stands, cartridge boxes, food or drink, etc., you are to remove it from the property and dispose with your personal household waste. You may leave bullet casings in the supplied bucket (not on the ground) and lead in the berms. That's it. Details of this new policy were distributed by an email reminder on March 15. The president of the Virginia Division, IWLA has notified us that the Alexandria Chapter, in Stafford Virginia, is hosting an SOS Training Workshop on March 30, starting at 09:00. Ernie Padgette says that "If you, or anyone from any Virginia Chapter is interested in attending, the link to sign up is below. This is a great chance for all SOS volunteers and managers to get hands on training in the local area. 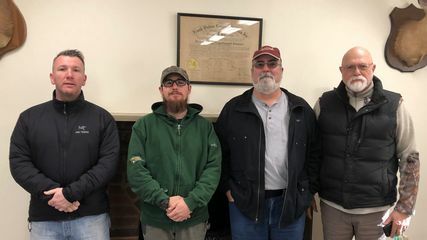 Thanks; Ernie P.
Several new members were inducted on Thursday, February 7, 2019.
elcome to our newest Ikes! Also note that last month's minutes were read and ratified at the recent meeting and those minutes and many others are also found in the same Member Only web location. The Chapter is an amazing asset if any member want to host an event on the premises. If you have an intent to host a group, make sure you do some advance planning and contact the Chapter's Event Planner, Greg Raines. Earlier in May, we updated the Chapter's House and Ground Rules and at the same time established a requirement for anyone desiring the use of the Chapter to access, download, read and complete the Request for Use of Chapter Premises. This document outlines requirements for use, releases the Chapter from liability and assures the requester the full knowledge of the Chapter's expectations. The document can always be found midway on the Facilities page. Please submit your completed application to Herbert Pritchett at email at hwpritchettsr@yahoo.com well in advance of the anticipated use so that you are assured of permission to use and no conflicts with other events. Always look at the Chapter Calendar when planning. The long awaited change from our previous Internet supplier to Comcast Business has been accomplished. We now have a high speed Internet, TV and telephone. If you want to access wifi at the Chapter you may use our guest access network line by setting up your device to receive the signal (you may find the credentials in the Member Only Login page). This access was fixed on May 6 so now it should work easily for all. Our new phone number, accessible at phone boxes outside the Chapterhouse, at the tool shed and a remote phone in the kitchen, is 540-412-9330. You can make outgoing and incoming calls. The bell does not riing loudly for incoming calls outside and if no one is close by do not rely on it being answered if it is an emergency. The previous phone service was limited to outgoing 911 and was "copper wire"; this new phone is VOIP and can be used for any local dialing which is especially useful for those members that do not have good cell phone service at the Chapter. .
See the Conservation tab for more information. Greg Raines indicated at the March Membership Meeting that the VA Department of Game and Inland Fisheries (VDGIF) is asking for volunteer Spanish interpreters for a class they will be holding for children. Anyone interested may contact Greg at 540-287-2628 (A text message works best). 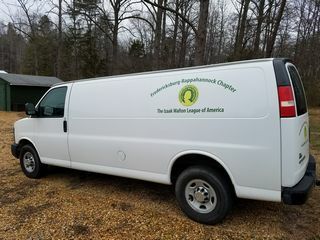 Thanks to the efforts of one of our members, we have a vehicle that we can use for chores around the Chapter and to support our activities off-site. The Chevrolet E3500 van looks and runs like new and was donated to the Chapter by Dominion Electric. The decals were added so that we can be visible in our community and project our image of Conservation and community service. 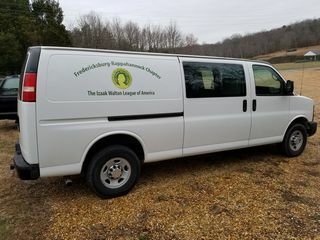 The van will become very useful in July when we need to transport cargo to the site of the National Convention we are hosting in Fredericksburg. Members are reminded that the Manahoac Bowmen organization operates an archery range which is inside the woods beyond the flag pole on the west side of the pond. No IWLA member is allowed to use that range for archery purposes without the permission and guidance of the Manahoac Bowmen. 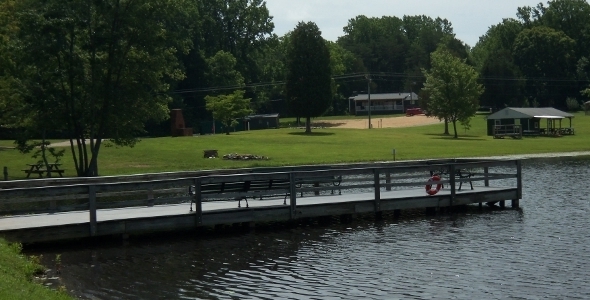 There is a series of ranges for use by IWLA members to the right of the Bowmen's building. It is situated between the Shotgun Range and the Bowmen's building. There are several shooting lanes of varying distance for targets primarily for arrows with field points. Archers shall not be using broadhead arrow tips on any target not designed for their use. If you are not familiar with this prohibition please reference the Chapter's range rules. If you do not understand the basis for the requirement, do not shoot broadhead arrows without consulting someone in charge of the Manahoac Bowmen organization. Shooting broadhead arrows at targets meant for field points damages the targets severely. Broadhead arrows are razor sharp and designed to rip and tear flesh. If shot into a target meant for field points they can easily break off and present a very severe hazard to anyone left with the task of repairing the targets. Violators of this prohibition will be severely penalized. Again, do not use broadhead arrows unless you know what you are doing. The person or persons that shot these arrows into field targets obviously did not know what they were doing or were maliciously/willingly damaging property. Please direct any questions about the archery ranges and range requirements to Eugene Slagle at eugeneslagle@gmail.com. You can obtainin additional information about the bowmen organization at their web page. At the April Chapter Membership Meeting, George Lear reported to the membership the existence of a service that the Commonwealth of Virginia provides to its citizens. This service is a secure website that can be used to store important documents that protect your legal rights and ensure your medical wishes are honored if you are incapacitated and unable to manage your own care. The database of Advance Directives at this website is held in a confidential and secure site, protected by the most up-to-date web and database security standards. All information submitted is used only by authorized individuals and kept completely confidential. If you are interested in learning more about this service you can obtain all the information and subscribe by linking here. If any of our members (or anyone else for that matter) shop using Amazon, it takes just a few adjustments of your account to have the Amazon company donate a percentage of the sale to the account of the Fred-Rapp Chapter at no cost to the member. The percentage is small but just in the last quarter the Chapter has earned nearly $10 through this no cost feature of Amazon. See our Donations tab for access to the steps to make this happen for the benefit of the Chapter. Or learn more about Amazon Smiles and how to use this feature by clicking here. A very nice electronic camera found at the Chapter several years ago. Send an email to newsletter@iwlafred-rapp.org describing your lost item and we will figure out a good time to get the item back to its proper owner.